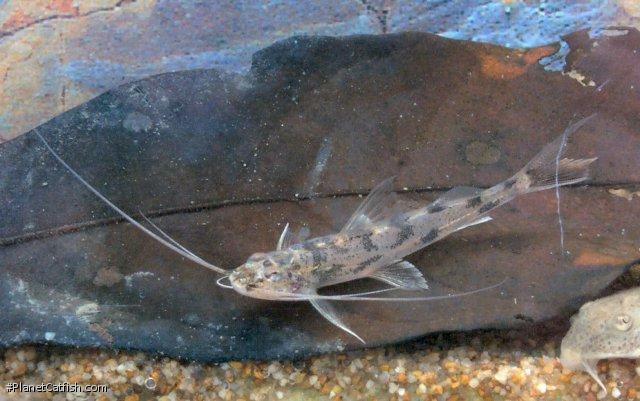 For the second month running we have a very welcome Catfish of the Month article from Richard Broadbent. This month focus is put on a fish I am personally familiar with, so I've added a few notes of my own to Richards words. I can, however, do no better that start with his introduction, "Ladies & gentlemen, let me introduce this seldom seen little cracker". Imparfinis historically were difficult to import alive due to the rigours of transport and significant losses could be expected, (indeed Sands reported in CotW Volume 3 (1984) that of the Imparfinis minutus specimens he collected, non survived initial collection). This may be due to poor handling & shipping but this species inhabits the shallows of fast flowing waters of the Amazon, Ucayali, Orinoco & Maranon amongst others so they are used to high oxygen content which impacts on their health & well-being in captivity & in transport when not adequately provided. Clearly shipping methods have improved as I. imparfinis are now occasionally seen. Jools also notes that he had no difficulty in importing eight specimens from Venezuela that he collected himself. In his view they are no where near as indestructible as larger Pimelodus species, but certainly do not require sustained high levels of oxygenated waters or cooler temperatures which are often the factors in a fishes requirements that make transportation more difficult. Once back in the UK, the fish acclimatised well and lived for between seven and nine years. He's given the common name of Shrimp Catfish as, when first encountered in a net they look and move just like the translucent crustaceans they are commonly found with. They prove to be excellent denizens in tanks where they cannot be bullied or indeed suffer from the inquisitive or aggressive tendencies of tank mates. They will not eat any companions with the exception of fry and extremely small species. They are unfussy as to foodstuffs offered and eagerly accept dry prepared foods like tetra prima or flake but do show a preference for frozen brine shrimp and bloodworm plus tetra delica. Sand should be used as the substrate as these fish spend a lot of time buried and even if totally hidden the tracks they leave give you an indication of their whereabouts. Often their "faces" are exposed which leads me to believe they may use this substrate concealment as an ambush feeding method in the wild but equally diving into the substrate would provide protection against certain predators. In aquaria they also seem to spend a lot of time on elevated flat surfaces line rock ledges, submerged branches and wide flat leaves like Anubias spp. Perhaps this acts as a vantage point to ambush prey? These are lean little sandy brown 'torpedoes' with darker olive body blotches, a deeply forked tail devoid of markings & long barbels similar to the well known Pimelodus pictus. Depending upon conditions, a bluish metallic sheen can sometimes be seen. Examination of large batches of recently imported specimens indicated there were a few which were physically identical but were a solid dark grey-brown which did not shoal with the rest. I am unable to say definitely whether these were the same or a different species or simply individuals suffering greater stress than the others. Within my group there appears to be little interaction of significance, mostly it appears to be minor squabbling during their very energetic feeding, or ousting one from their elevated perching position. One of the smallest catfish species around and I would highly recommend trying out a group if encountered on your fish buying trips. Type Locality Río Tucuragua, near Caicara, Bolívar, Venezuela. Distribution South America: Orinoco and Ucayali River basins. Other Parameters Prefer a brisk if not strong current, in nature they are found in only a few centimetres of water to about 60cm depth. Feeding Will feed on prepared and frozen foods. Furniture Substrate should be fine sand, as they do hide in the substrate. Compatibility May eat fry from other fishes, but their overall size is small, so most fish will be fine - even neon tetras and such would be large enough to not become a meal. Suggested Tankmates Compatible with most fish that are not much larger or so small they become part of the menu.